LEXINGTON, Ky. (Friday, December 19, 2014) – The National Thoroughbred Racing Association (NTRA), Daily Racing Form and the National Turf Writers and Broadcasters announced today that Old Friends, the nonprofit Thoroughbred retirement center, will be presented with the Special Eclipse Award during The 44th annual Eclipse Awards on January 17, 2015, at Gulfstream Park Racing & Casino in Hallandale Beach, Fla. Founded in 2003 by former Boston Globe film critic Michael Blowen, the 501(c)(3) nonprofit based in Georgetown, Ky., cares for more than 150 rescued and retired horses, including several pensioned stallions. This year Old Friends became the new home for two of racing’s biggest stars from the past 20 years, bringing 1997 Kentucky Derby hero Silver Charm back to his native state after retiring from stud duty in Japan and acquiring three-time Santa Anita Handicap winner Game On Dude after the 7-year-old gelding finished racing. Other American Grade I winners currently residing at the main farm include Amazombie, Affirmed Success, Afternoon Deelites, Bonapaw, Commentator, Dinard, Early Pioneer, Fabulous Strike, Geri, Gulch, Hidden Lake, Kiri’s Clown, Kudos, Ogygian, Sarava, Sean Avery, Seek Gold, Special Ring, Tinners Way, Wallenda and You and I. Additional fan favorites include Rapid Redux, winner of 19 consecutive races in 2011, and Little Silver Charm, the operation’s miniature mascot and the farm’s only non-Thoroughbred. Old Friends also operates Old Friends at Cabin Creek: The Bobby Frankel Division near Saratoga Springs in upstate New York, where past Travers winners Thunder Rumble and Will’s Way greet the public, along with infamous 100-time loser Zippy Chippy. Even while working full-time for the Globe as a staff writer, Blowen would spend mornings at Suffolk Downs working for veteran trainer Carlos Figueroa. Mucking stalls and walking hots aren’t typical side jobs for journalists, but for Blowen they were excuses to satisfy his growing fascination with horses. 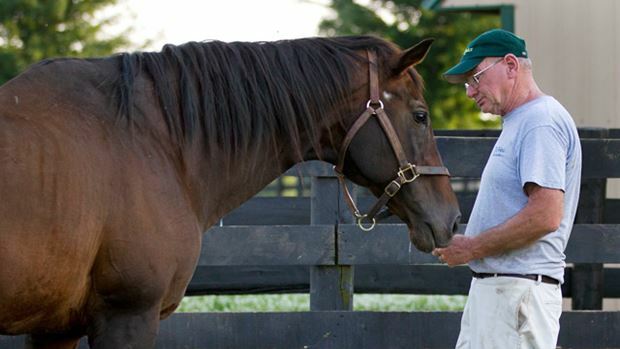 Shortly after Blowen retired from the Globe he accepted a position in Kentucky as Operations Director for the Thoroughbred Retirement Foundation. In 2002, the news that 1986 Kentucky Derby winner Ferdinand had perished in a slaughterhouse spurred Blowen to form his own operation, with an emphasis on retired stallions. Old Friends would be accessible to the public as a way of raising awareness for racehorse retirement and improving racing’s image. The presence of high-profile stars would help to raise money and give comfortable homes to lesser names. The farm is run by five full-time employees, four part-time employees and a dedicated group of 24 volunteers. Blowen praised his team, particularly the cast of volunteers. Old Friends offers daily tours and attracts up to 1,000 visitors per week during their busiest times of the year. For more information, including how to donate or volunteer, visit OldFriendsEquine.org. The Special Award will be given for the 24th time since it was inaugurated in 1971 to honor Robert J. Kleberg, manager of the famed King Ranch. Subsequent recipients have included racing luminaries such as Bill Shoemaker, C.V. Whitney, Edward J. DeBartolo, Richard Duchossois, Russell Baze, Laffit Pincay Jr., Dale Baird, Team Zenyatta and last year’s recipient, the Thoroughbred Aftercare Alliance (TAA). Old Friends will be the third aftercare-related recipient, following Monique Koehler, founder of the Thoroughbred Retirement Foundation, in 2009, and the TAA. The Eclipse Awards, presented by Daily Racing Form, Breeders’ Cup and The Stronach Group, are bestowed upon horses and individuals whose outstanding achievements in North America have earned them the title of Champion in their respective categories. Those awards are voted by NTRA, Daily Racing Form and the National Turf Writers and Broadcasters (NTWAB). Awards also are given to recognize members of the media for outstanding coverage of Thoroughbred racing. Tickets to The Eclipse Awards ceremony are on sale for $400 each or $4,000 for a table of 10, also via Ravencraft. For reservations, please contact Michele Ravencraft of the NTRA at mravencraft@ntra.com, or call (859) 422-2657. For more information on The Eclipse Awards, visit ntra.com/eclipse-awards.